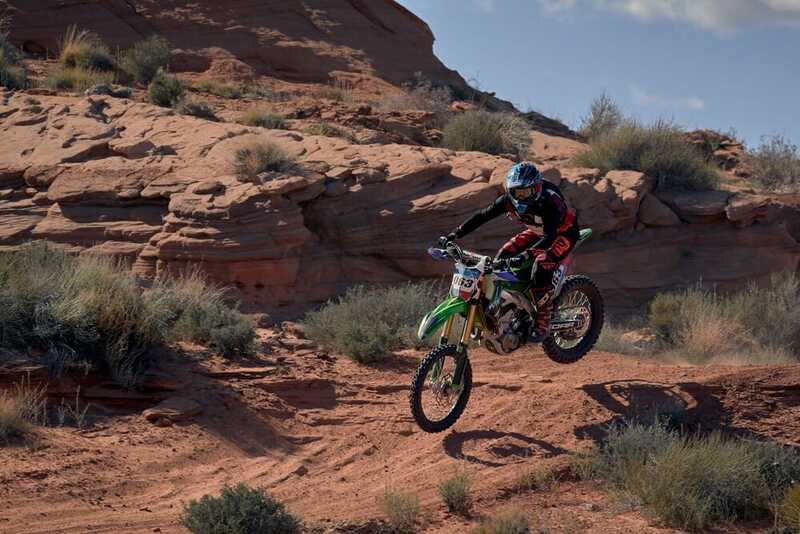 Page, Arizona (March 30-31, 2019) – The Arizona Offroad Promotions Rowley White RV Series made its way north to Page, Arizona and the picturesque edge of Lake Powell for the third round of the 2019 season. 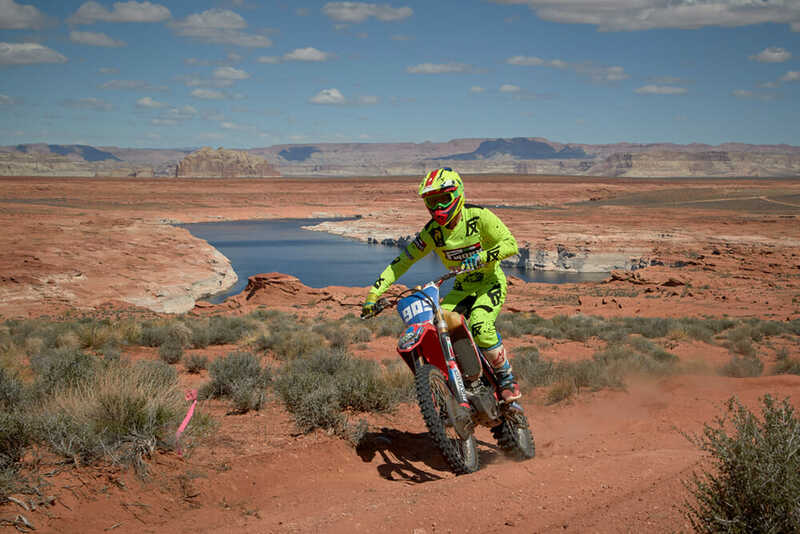 Though the Lake Powell race has been a staple of the AZOP series, this year’s race weekend—which was presented by Page Honda Polaris, B&B Auto Repair, and Antelope Slot Canyon Tours—featured a new format in the form of a short-course grand prix race on Saturday and a long-course hare scramble on Sunday. The Saturday short course was a heavily whooped-out and mostly very sandy five-mile loop, while the 15-mile Sunday course used the first half of the short course, but then split off and ran down to the bluffs above the lake, which kept competitors on their toes by sending them out of the soft red sand and onto the slippery rocks. The rocky sections were surprisingly technical, with steep drops, off-camber sections, and softball-sized rock gardens leading directly into sandy climbs. Racers and volunteer sweep-riders all seemed to agree that this was one of the most challenging and interesting tracks AZOP has ever run. I can personally attest that my poor KLX 450 got dumped in the deep sand a handful of times, and I heard several of the sweep riders make similar remarks about their own rides. Sure enough, a cursory glance at social media after the weekend revealed a wealth of helmet-cam footage from riders struggling through the various sections of the course. In the end no one was complaining, and even the riders and drivers who struggled seemed to appreciate the challenge posed by the AZOP track-makers. Saturday’s racing started bright and early as a beautiful, calm day dawned in Page. The “pee wee” classes were up first as they took to their own short course, which was essentially the infield area of the full-size track near the pits. Even for the kiddie classes, the course was sandy and difficult, with some big whoop sections and steep hills. In the 50cc 4-6 Years-Old class it was Courtney Curley (25) making her way to the top spot on the podium. Brayden Almendarez (187) finished second, and Jayce Tracy (301) finished third. The mini bikes saw a relatively large field and featured some extremely close racing. Keegan Hardy (381) held on for the overall and 80-150cc A Mini class win, finishing just 1.6 seconds ahead of Jonathan Kirat (1429), who took second in class and overall. Third overall and in the class went to Brett West (532). As the beautiful morning gave way to a warm and clear afternoon, the 60-plus entries in the Big Bike classes headed to the starting area for their turn on the sandy whoops of Page. The Pro class and overall podium was topped by Miguel Cordovez (909), who put in six smooth laps. Taylor Stevens (063) took the second spot in class and overall 25 seconds later. For the second time on Saturday, Jarrett Curley (047) put himself on the podium, this time in the third spot in class and overall, having won the Big Quad race earlier in the day. The Open A class went to Austin Alexander (95), who managed to find the speed to finish 3-plus minutes ahead of second place, despite not having a functional fifth gear. The second podium spot went to Luke Vermilyea (96), and third place went to David Richards (196). Richard Genovese was the only entry in the Super Senior 60+ class, but that didn’t stop him from completing five laps and ending up well into the top half of the overall standings. As a second day of perfect weather dawned on Sunday, the pits were buzzing with activity as the first-time format change called for a very different course that would force riders and drivers to adapt on the fly without the benefit of having seen the full track the previous day. As the larger classes made their preparations, the Pee Wee riders and drivers took to the short “infield” track to duke it out in the sand. 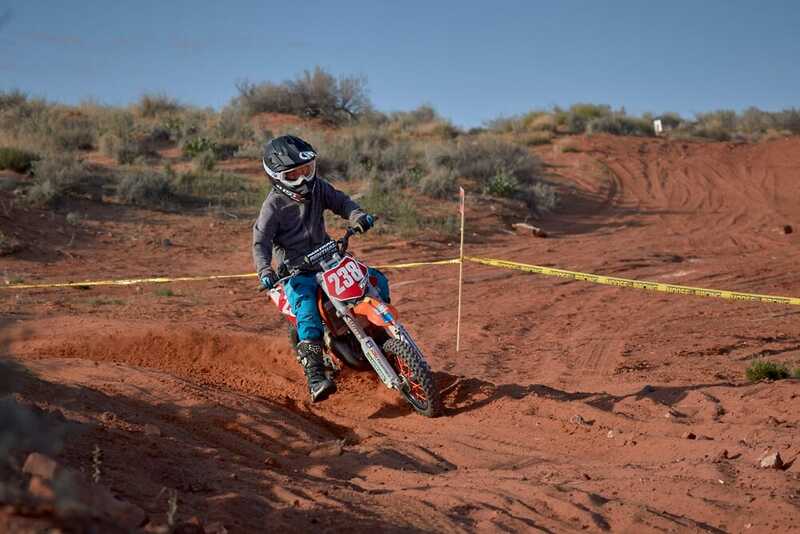 First up on Sunday were the Pee Wee Bikes, and, just the same as she had on Saturday, it was Kaycee Curley (238) putting on a clinic. She completed 20 laps and took the overall win as well as the 50cc 7-8 Years-Old Pee Wee class. Rhylan Benally (12) finished second in class and overall, while Ryder Yates (153) finished third in the class. Curley leads the season’s points standings with 120, followed by Lane Oden in second with 67, and Benally in third with 50. In 65cc C Pee Wee, Aayden Tracy (308) took the class win and was good enough for third overall. Karlyle Barney (045) took second in class and Wyatt Massey (419) took third. Tracy now owns a share of first place in the season standings with 60 (tied with Cooper Skersick). Chase James sits in third place with 59 points. 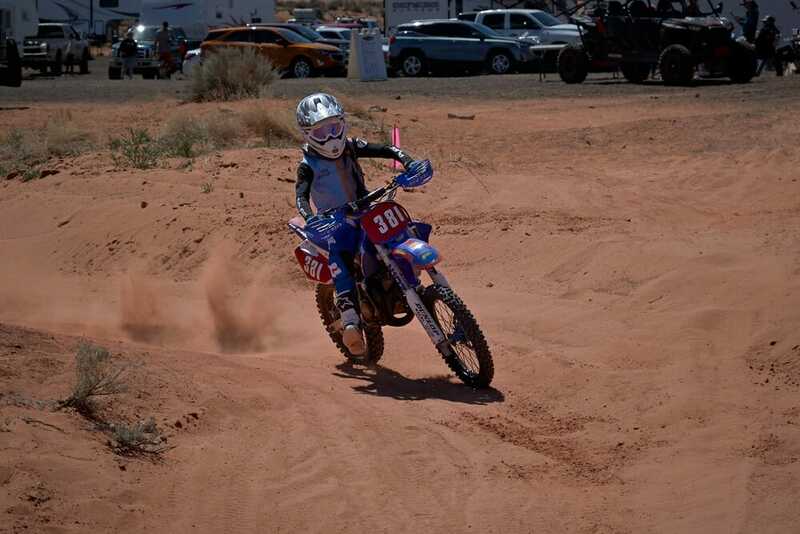 Brayden Almendarez (187) took first in the 50cc 4-6 Years-Old Pee Wee class. Courtney Curley (25) was second and Jayce Tracy (301) took third. Curley now owns a commanding lead with 136 points on the season. Almendarez is in second with 85 points, and Hayden Griffith is third with 57. The 80-150cc C went to Clayton Hixon (130) for the second day in a row. Danny Carter (71) took the second spot on the podium. Colson Skersick (413) rode into third place. Colson leads the series points with 121, followed closely by Jaxon Steele at 115 and Skersick at 104. As always AZOP would like to thank all of the sponsors, staff, volunteers, racers, and spectators for making this another successful and fun weekend of racing. For more coverage, videos, and photos, or to find out about upcoming events, visit www.azopracing.com.